Our biggest news is the birth of our newest grandchild on Tuesday. He belongs to John and Traci and was born 3 1/2 wks early but is a healthy 7 pounds 2 ounces and is doing well. Of course, he is beautiful! We have survived our first week in Chile and are still smiling. Our clinic was very busy each day and we have had many questions and 'issues' to resolve but I am learning my job in reception and have a great time visiting with the missionaries. I also type in all the notes that Dave writes up after seeing the missionaries and assist with minor procedures like partial toenail removal. I even got to go over to the MTC, which is here in the same block as the Santiago Temple, the MTC and the Area Office, and give immunizations. It is a treat to be with missionaries. Dave is very busy advising missionaries over the phone and seeing missionaries in the clinic. He feels that many of the symptoms that the missionaries are relating are at least partially stress related, due to the earthquake. Many of them even realize this. They say that their symptoms started just after the earthquake. It was a very traumatic experience for many of them who experienced severe shaking. One missionary related that her companion's cousin (just a toddler) was ripped from his mother's arms by the tsunami. Even though she had put a flotation device on him, they have never found his body. Some ran outside their building only to find live electric power lines flipping around creating further danger. It is a great blessing that no missionaries lost their lives but many of them are traumatized by that experience to one degree or another. The temple had a little damage but not much. Angel Moroni lost his trumpet but it was soon replaced. For some reason, they had a spare trumpet on the temple grounds. There are still many aftershocks. On Wednesday we had two large enough to require us to vacate the building for a few minutes. One was measured at 7.2. The other was milder but continued for quite awhile which is a little disconcerting. We have just learned that my nephew, Jordan DeMann, has been called to the Concepcion Mission and we are so excited about that. We are pretty sure to run in to him a few times. We did run into his best friend on Thursday. The friend is serving a mission here in Santiago. We were visiting about where each of us came from and I said I was from Murray and that my sister and mother were still living there. Without any other information, he said "Challis?" (my maiden name). At about that very same time we met Amberlyn Peterson, Warren Peterson's daughter, from Delta and a young elder from the Copan area of Honduras which is very close to where we lived in Guatemala. We have learned from Dave's sister Marsha that we are now working with a senior missionary here whom she knew on her mission in Uruguay. It is a very small world. We are pretty well settled into our apartment and find it very comfortable. It is big city living--something we are not used to--but are adjusting well. We even have our Vonage phone working so we can call the US without international rates. I can just pick up the phone and call anyone in the states just like we were in Fillmore. Yesterday we were taken by a senior Elder who has a car to a BIG mall which has a store like Walmart named 'Jumbo' and another store similar to Home Depot named 'Easy'. It was quite the experience. They have large escalators which are made to grab the wheels of your shopping cart so the carts can go up and down the five levels to the parking below. The previous couple had nursed along two stray kittens who have adopted the church compound as their home. We are befriending them and have promised to have them 'fixed''. I was asked to substitute for a sick sister and accompany on the piano in Sacrament Meeting and Primary. Then they asked me to do choir. Then five or so teenagers came up and asked if I would teach them piano. Several had started in the past but their teacher had moved. I was pretty excited about that. The climate here is wonderful--like Southern California--and it is most beautiful. Life is good! 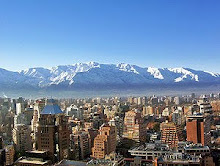 It sounds like you are really enjoying the beginning of your stay in Chile. It's good to hear that no one of the missionaries was harmed during the earthquake. Do take care, and I'm looking forward to the next blog entry. i'm not commenting on every post but i'm reading them all! i'm glad you're safe and that's cool to hear about jordan. it looks nice and green and warm there. I am enjoying your blog. It is wonderful that you are there and having such experiences. I'm sure the missionaries all love you! What a privelege it is to help them. Congratulations on your beautiful little grandson. He's a doll!